A lovely rhubarb preserve with zingy ginger: simply delicious! 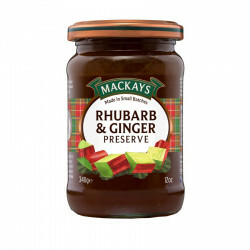 A unique preserve of rhubarb and zingy ginger for a simply delicious jam! Ingredients: sugar, glucose syrup, rhubarb (33%), setting agent (fruit pectin), ginger (2%), lemon juice.